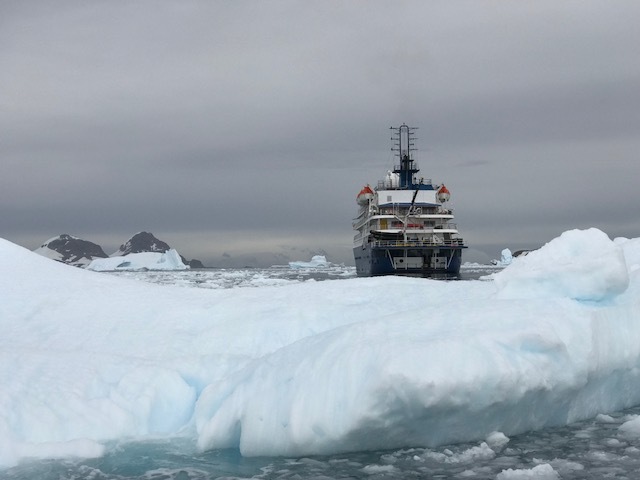 Our Ship, the Sea Spirit, in the Antarctic. 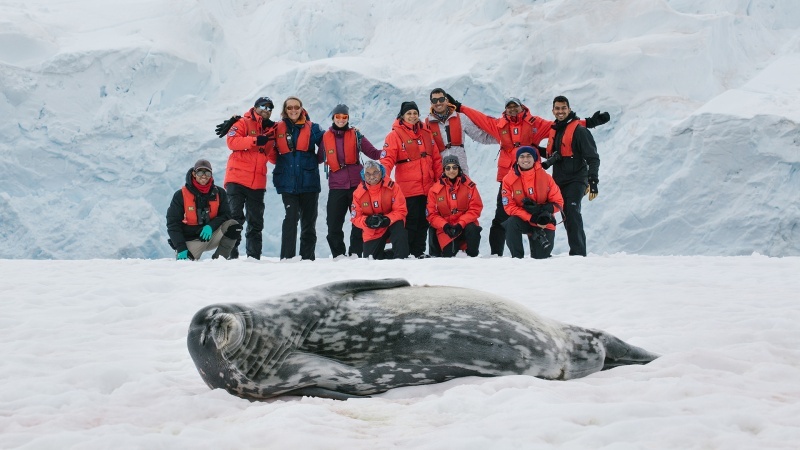 A trip to Antarctica is on every traveler’s “bucket list”… and a trip that takes you south of the Antarctic Circle is an even finer “bucket”. 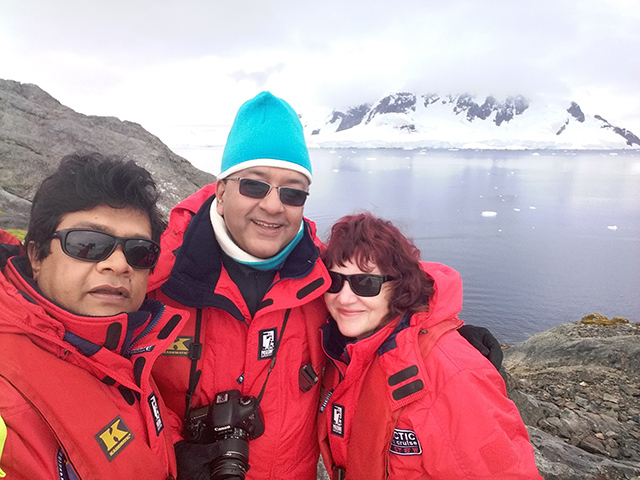 Such cruises are not for the budget traveler, but who could resist when we kept hearing that the place was melting? We thought we had better get down to see it before it was gone. Well, we can tell you that even though it IS melting, there is still a lot of ice left. Fred with his Only Camera. 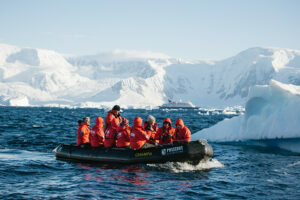 All cruises to the Antarctic occur during the southern summer, when sea ice is at its least dense. Even then, however, it is never certain that you will reach any particular place the cruise company might promise. It is decided by both the ice and the storms that rage all year long across the Drake Passage. 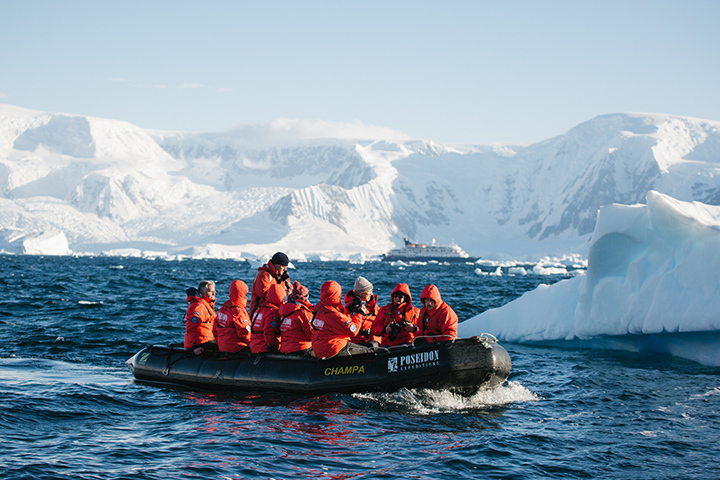 Most cruises stop in various hideouts along the more sheltered islands and coves along the west side of the Antarctic Peninsula. 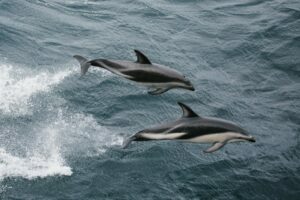 Dusky Porpoises off our Bow. 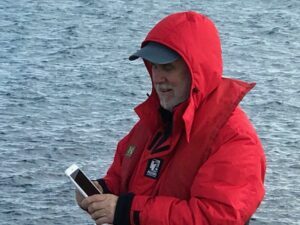 Our cruise company, Poseidon Explorations, plans one trip every two years at the height of the summer (February), when the sea ice is the least, to try to go below the Antarctic Circle. We were grateful that ice and weather conditions allowed the ship to accomplish its goal of reaching south of the circle with us on board. Here are some facts: The Arctic is frozen water surrounded by land. Antarctica is a frozen continent surrounded by water. At 5 1/2 million square miles, its land mass is larger than Europe. Amazingly, it doubles in size in winter when it is iced in! 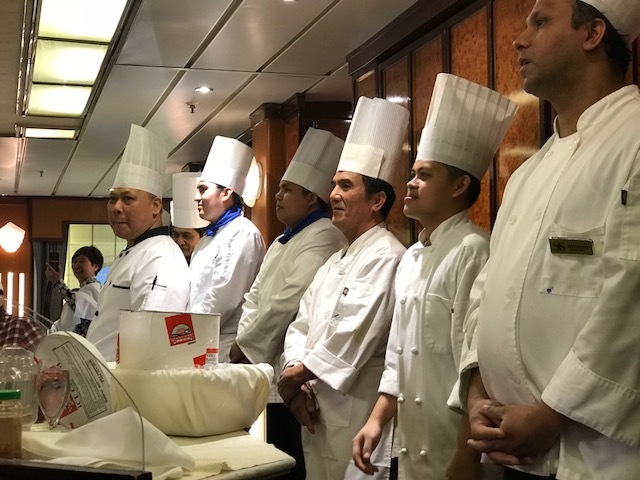 Chefs on Board the Sea Spirit. An ice sheet covers 98 percent of the land mass, and is 15,000 feet thick in some places. The continent contains about 70 percent of all the fresh water on earth and 90 percent of the ice. It is the coldest continent. A Russian research station recorded minus-89 degrees Centigrade near the South Pole. Antarctica has so little precipitation that it is classified as a desert. It is the highest continent on earth, with an average elevation of 7,500 feet, as well as the windiest, with gusts up to 200 miles per hour. 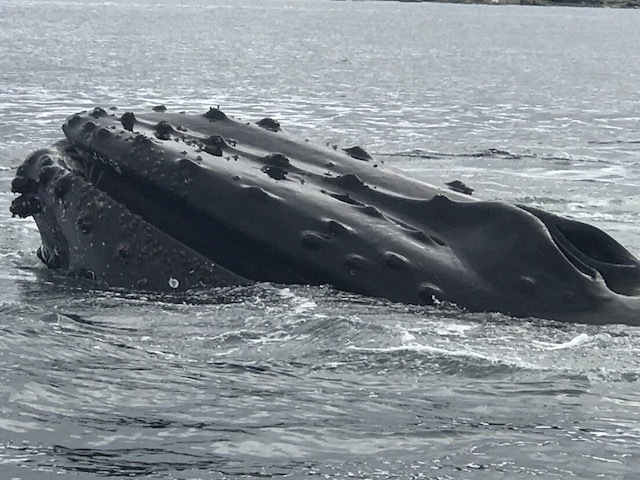 A Humpback Whale Observing Us. Antarctica is also visited in the three months of summer every year by between 30,000 and 45,000 people, all on ships like ours. What is interesting is that the ships cruising in the Antarctic agree to work hard together to plan their movements so that one is never in sight of another. This requires lots of coordination, some of it requiring last-minute changes. This strategy works to enhance the overall effect of remoteness and isolation. Sharon and Some of Her Friends. There is little flora but lots of fauna in Antarctica, and we certainly saw a lot of wildlife. 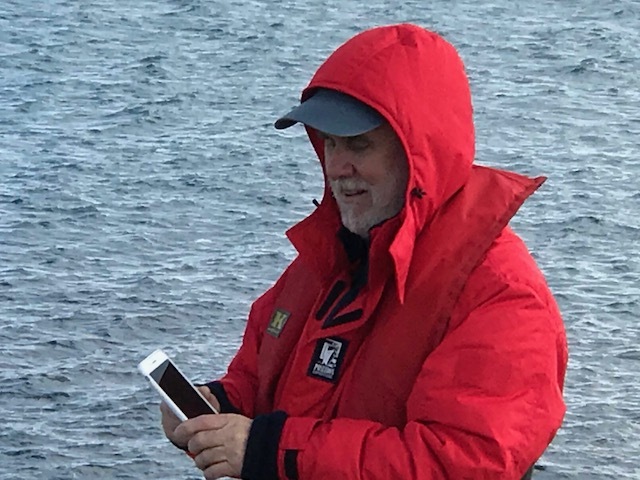 Besides dozens of species of birds, and several species of penguins (everybody’s favorites), we saw several types of seals, as well as dolphins, orcas and dozens of humpback whales. We passed up the opportunity for kayaking and spent our time either walking on shore or cruising around in inflatable zodiacs. We also passed up the chance for a “polar plunge” in the icy water. On the zodiac excursions, our favorite sights were the numerous humpback whales we saw every day. One benefit of the climate change warming the water is that more algae blooms feed more krill, which in turn feeds more whales. Another side effect of the retreat of glaciers is that land once thought to be mainland now turns out to be islands. 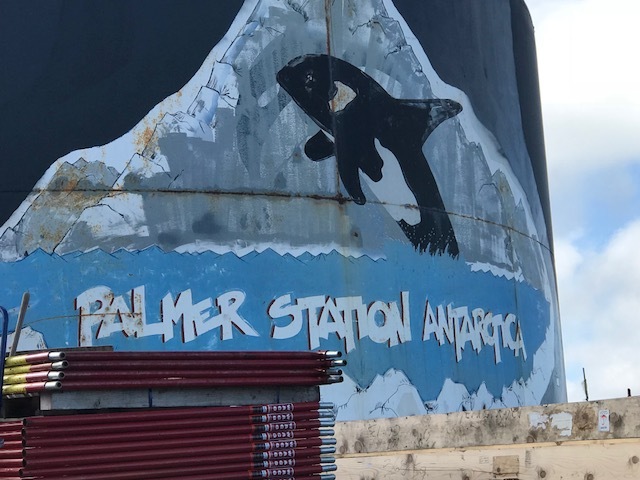 The U.S. base that we visited, Palmer Station, was once assumed to be on a major island. It now turns out to be on its own fairly small island that is removed from the shore once the ice melts in the summer. The only good news we heard in lectures about climate change is that the decline in the use of ozone-depleting chemicals has resulted in 20 percent less depletion in the shrinking hole in the ozone layer. Whew. Logo for the U.S. Base, Palmer Station. The fauna ON our ship was often as interesting to watch as the creatures in nature. We had a small number of Americans, Brits and Australians; a dozen or so Russians; and a dozen Germans. Interestingly, some of the Germans did not speak English, having grown up in East Germany, where Russian was the second language. All English-language speeches and printouts were translated into German, Russian and Chinese. Even the films, etc. showed in the staterooms were programmed in the language of the individual travelers. 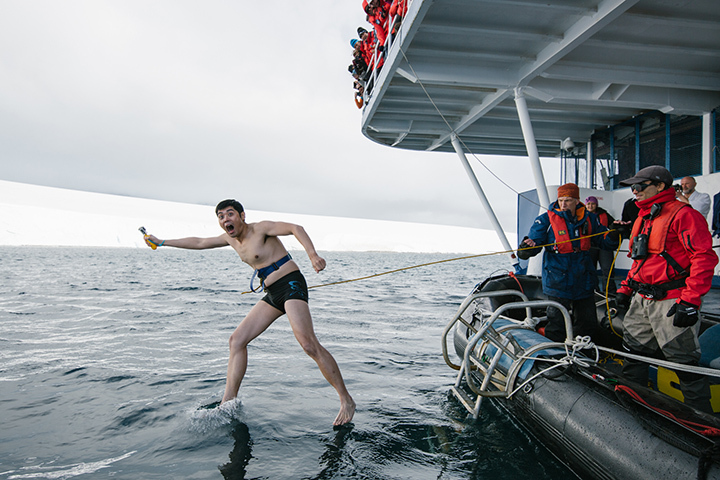 One of the Chinese Guests Doing the “Polar Plunge”. The big surprise was that 46 of the ship’s passenger load of 120 people were Chinese. Only a few spoke English, but all were enjoying the opportunity to travel the world with their new-found wealth and freedom to travel. Most of them also carried gigantic cameras. What a wonderful trip! A little envious but so glad you were able to go and write about it to share with us. How wonderful! Looks like Fred and Sharon had a great time and used their wisdom to pass on the Polar Plunge. Seven years ago, I was standing on Antarctic soil (no ice) that was showing some grass growth. It was extraordinary and disturbing! Their summer is about as warm as Whidbey’s average winter. The penguins really are friendly because humans have not hunted them (yet) and we are the visitors to their homes. Fred and Sharon, thank you for sharing your adventure. It is important to continue to learn and experience our changing and warming planet. You rock! Loved your photos and commentary. What a great trip! You might remember me. I’m Al’s friend from Minnesota. Hi Marcia! Great to hear from you. The polar plunge sounded too much like Minneapolis growing up in my youth. Hope you are traveling a lot too! Sounds like an interesting trip even though very cold. We should meet some time some where – Seattle? Hope Mike and Susan are doing well. Plus, I did a polar plunge. As usual, so interesting to read about your travels. I always learn something new. Thank you for sharing. I LOVE experiencing your travel adventures vicariously! Even though we are so close to Antarctica while here in Southern Chile, I don’t know that we’ll ever make it there. Your photos are AWESOME. The glorious blue skies in stark contrast to the pure white snow. The humpbacks must have been amazing. We are so fortunate to have you share the wonders of places we may not visit! You are all trailblazers! We’ll be back in Langley in a couple of weeks and will see you soon. WOW neat trip! Crazy tourist destination to be sure – but where are the rugs?? Not even polar bearskins found in Antartica! So when will the penguins learn rug-making…. Great trip! What did you do to book this trip? Sounds like something we would like to do in two years!